Have you been fortunate enough to escape this winter without experiencing a roof collapse from the weight of snow and ice? Do you know how your insurance coverage would have responded? Whether a collapse or other loss- fire, explosion, hurricane, etc.- there will always be debris that must be removed before rebuilding can begin. 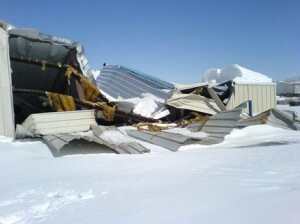 When determining the cost to replace your building, did you also consider the cost to remove the debris from your site? Are you aware if any hazardous materials in your building would require special handling? These costs can be significant and the most common property policy only include coverage for Debris Removal equal to 25% of the loss (amount paid plus deductible) up to the building and/or content limit. An additional $10,000 per loss is available if the building and/or content limits are exhausted. As well, many carriers offer additional coverage via their enhancement endorsement. Note that debris removal is intended to solely cover removal expenses for damaged property caused by a covered peril. It will not apply to the cost to extract pollutants from land or water; or to remove, restore, or replace polluted land or water. Debris removal expenses, incurred or anticipated, must be submitted in writing to insurers within 180 days of the loss unless a carrier’s approval has been received for an extension. When determining your building replacement value, it is important to calculate the potential cost of debris removal in the case of a total loss. In the event of a total loss, you will have exhausted your building and/or content limit and be left with only the $10,000 additional limit for debris removal, which will often prove insufficient, unless additional debris removal is purchased via endorsement. Collapse and Buildings: Under the “Special Peril” property insurance form, collapse is excluded with a minimal amount given back under the “Additional Coverage” section. Coverage is only provided when collapse results from one of the “Covered Collapse Causes” listed above. Collapse with respect to buildings means an abrupt falling down or caving in of a building or any part of a building with the result that the building, or part of the building, cannot be occupied for its intended purpose. A building or any part of a building that is in danger of falling down or caving in. Part of a building that is standing even if it is separated from another part of the building. A building that is standing or any part of a building that is standing even if it shows evidence of cracking, bulging, sagging, bending, leaning, settling, shrinkage or expansion. Collapse and Business Personal Property: If Business Personal Property is covered by a “Special Peril form”, the property will be covered if damaged by building collapse caused by one of the “Covered Collapse Causes” listed above. Collapse and Miscellaneous Property: Damage to the following is covered if a direct result of an insurable building collapse: outdoor radio, television, satellite, dish-type, or other antennas including their masts, towers, and lead-in wiring; outdoor awnings or canopies or their supports; fences; gutters and downspouts; yard fixtures; outdoor swimming pools; piers, wharves, and docks; beach or diving platforms or appurtenances; retaining walls; foundations; walks, roadways, and other paved surfaces. Collapse coverage provided by standard policy forms usually cannot be altered or expanded. With many of the insurance exposures facing businesses today, Debris Removal and Collapse are often not given the attention that they require. Debris Removal can be a financial burden if you have not adequately evaluated your potential cost and either financially planned so able to absorb the cost or adjusted your insurance program to cover. Let our team assist in securing coverage that will limit your out-of-pocket expenses.